In its fourth edition, Singapore’s biggest water sports festival, the DBS Marina Regatta returned to Marina Bay Singapore, brining great action and fun on and off the waters of Marina Bay. Covering over three weekends from 30th to 31st May, 6th to 7th June and 13th to 14th June 2015. 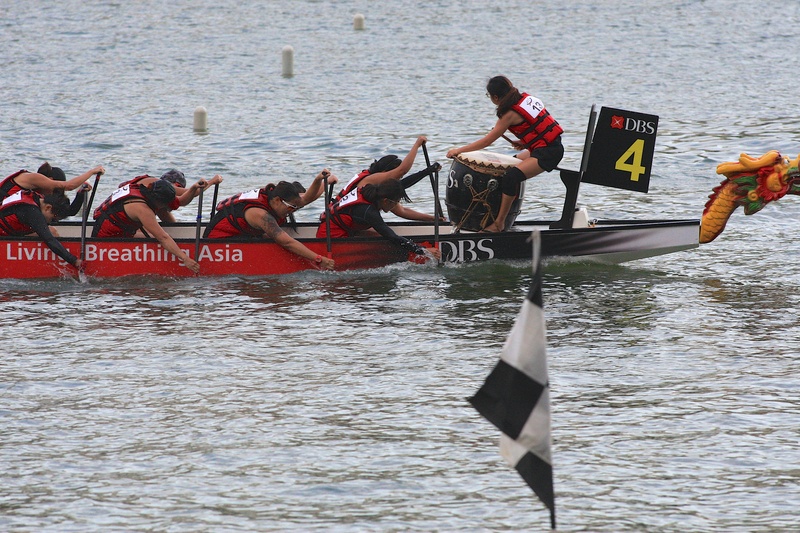 In conjunction with the 28th SEA Games 2015 held in Singapore from 5th to 16th June, Traditional Boat (Dragon Boat) Races were held together with DBS Marina Regatta on 6th and 7th June and Sailing Races was held on 13th and 14th June 2015. For DBS Marina Regatta 2015, there were close to 180 teams and 2,000 athletes participating in this year’s Dragon Boating event! There were also a growing number of female Dragon Boaters – close to 20% more than the previous year. This was indeed the biggest water sports festival in Singapore and it’s growing! Let me bring you through my eyes, heart, stories and photographs of the first weekend of DBS Marina Regatta 2015, on the 30th and 31st May. This was my third year covering DBS Marina Regatta, I am quite familiar with the Dragon Boat Races and schedules. On Saturday 30th May, it was the 200m race distance and on Sunday 31st May, it was the 500m race distance. There were lots of Dragon Boating action on the waters of Marina Bay whereby spectators can enjoy watching them in action at The Promontory @ Marina Bay, Marina Bay City Gallery area and Fullerton area. For this year, besides my fast action capture of fast and furious Dragon Boating paddling, I decided to go more into the “behind the scenes” part of Dragon Boating, the preparation, the emotions and camederie of the paddlers. The experiences were pretty amazing and these are the type of the other story of sports photography that we sports photographers love to capture and share. Through my photographs, I hope that I am to share more on the scenes behind the scenes. DBS Art Park ~ There were eight up and coming artists aged between 18-35 from NOISE working on four giant 2m by 2m art cubes. Living Art ~ The re-enactment of a painting, “Life by the River” by renowned Singaporean artist Liu Kang. DBS Food Village by Savour ~ Delicious food galore. I rotated myself around the various locations of DBS Marina Regatta 2015, photographing and documenting sports action on the waters, behind the scenes of the Dragon Boat, waiting, preparation, supporting, the euphoria and emotions. Towards the later part of the afternoons on both 30th and 31st, these were the time for the finale, the various finals for the 200m (30th May) and 500m (31st May). That’s also where I had the enjoyment and adrenaline rush of photographing the fast sychronised Dragon Boat paddling action on the waters of Marina Bay from the The Promontory @ Marina Bay. Over the first weekend of DBS Marina Regatta 2015 on 30th and 31st May, there were great action on the waters and off the waters, on the ground level. Rounding up my first weekend of DBS Marina Regatta 2015, I was looking forward to the second weekend with the 28th SEA Games Traditional Boat (Dragon Boat) Races in action together along with DBS Marina Regatta 2015!